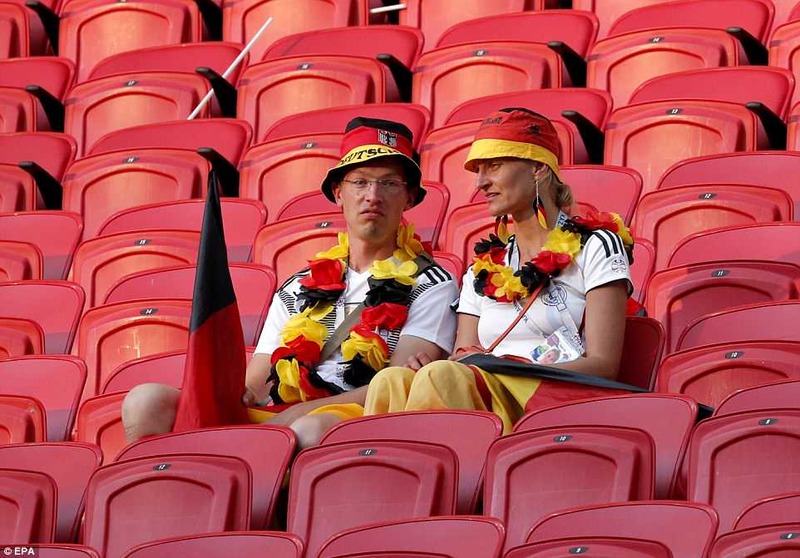 Football fans around the world could not hide their glee today as Germany crashed out of the World Cup in the group stage after losing 2-0 to South Korea. 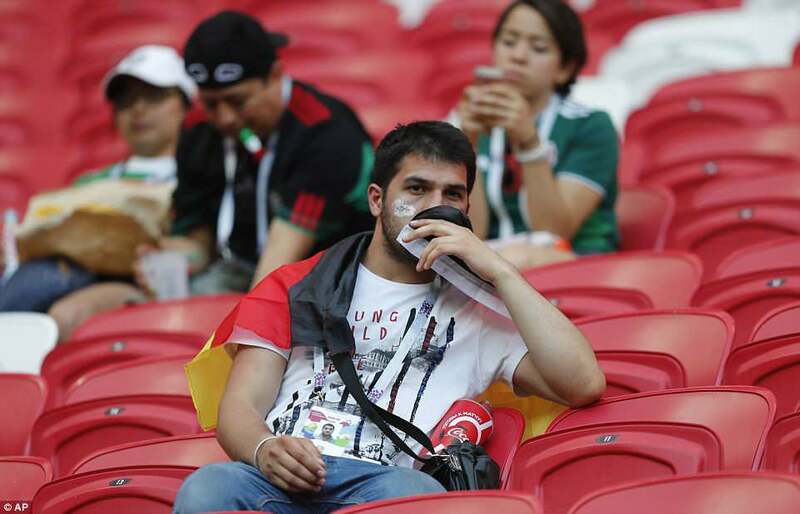 The defending champions had to beat the Koreans in their final group match or hope Sweden could not get a result against Mexico. 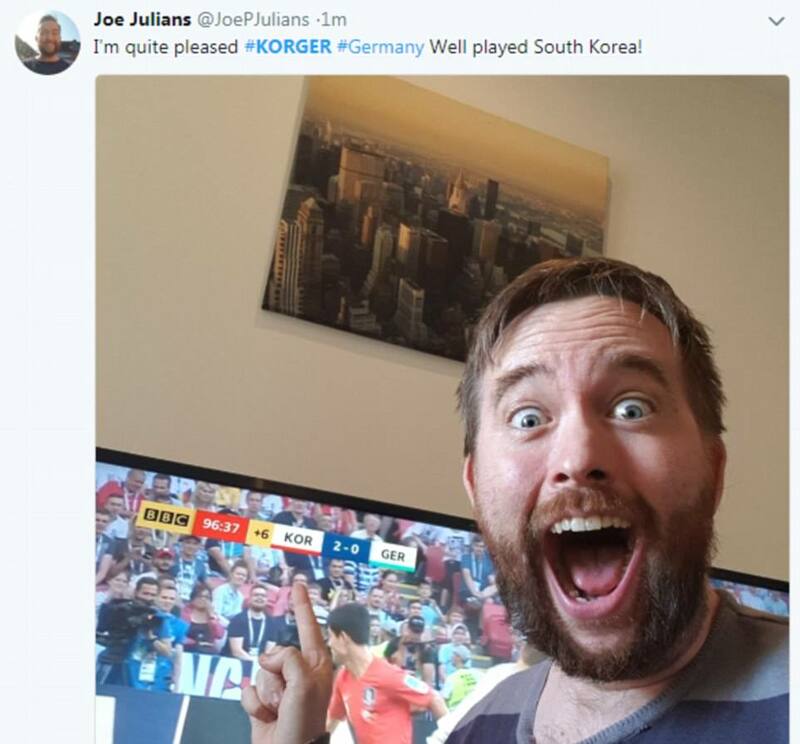 But despite peppering the Korean goals with shots, the Germans conceded two and, after Sweden won 3-0, Joachim Löw’s side were sent home from Russia earlier than expected. 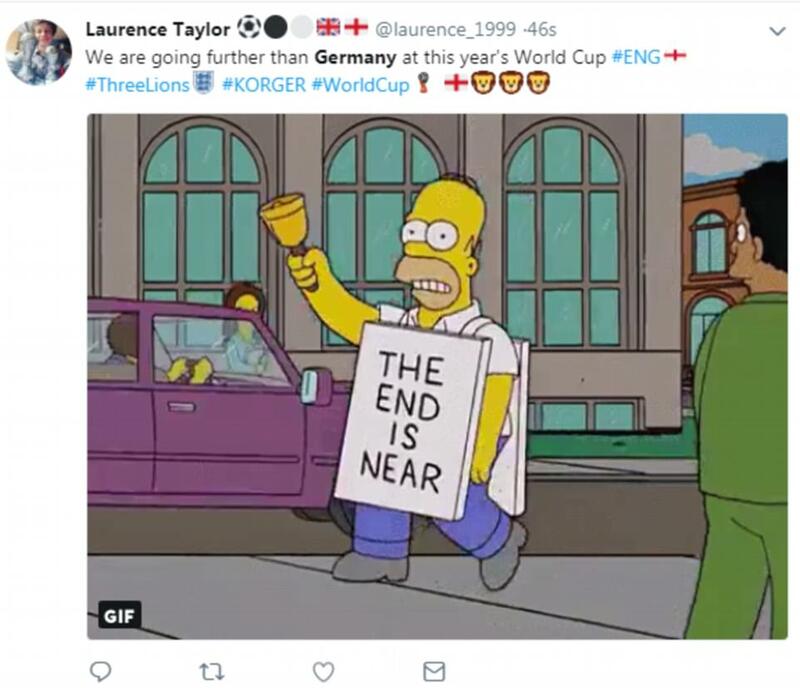 The result sparked joy for fans across the globe – especially of the Three Lions, who have often been knocked out of big competitions by Germany in the past, most memorably at Italia 90 and in Euro 96. 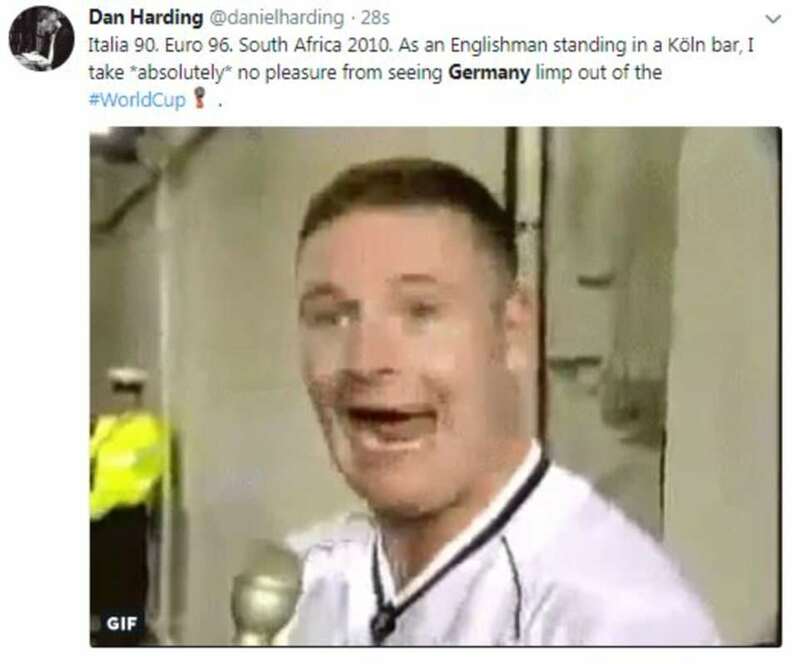 The result comes eight years to the day since Germany knocked England out of the 2010 World Cup by beating them 4-1 in Bloemfontein, South Africa. 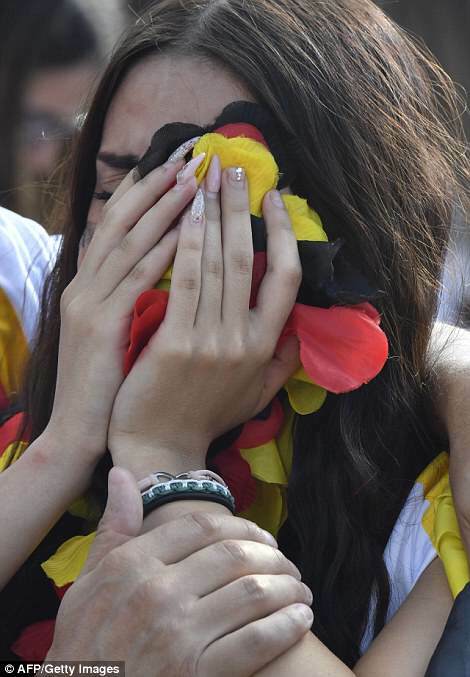 There was despair for Germans in Russia, Berlin and around the world, with some reduced to tears at their side’s horrific tournament. 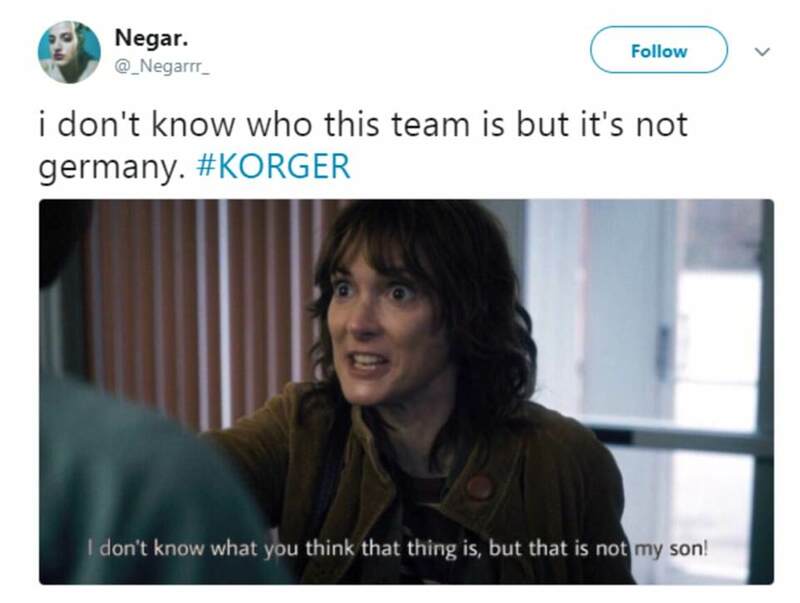 The defending champions had to beat the Koreans in their final group match or hope Sweden could not get a result against Mexico . 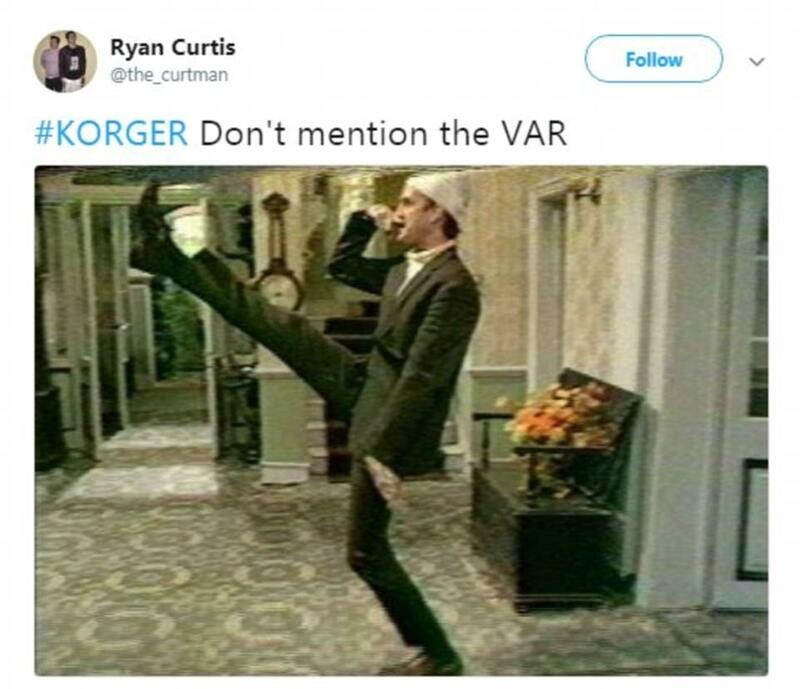 But despite peppering the Korean goals with shots, the Germans conceded two and, after Sweden won 3-0, Joachim Löw’s side were sent home from Russia earlier than expected. 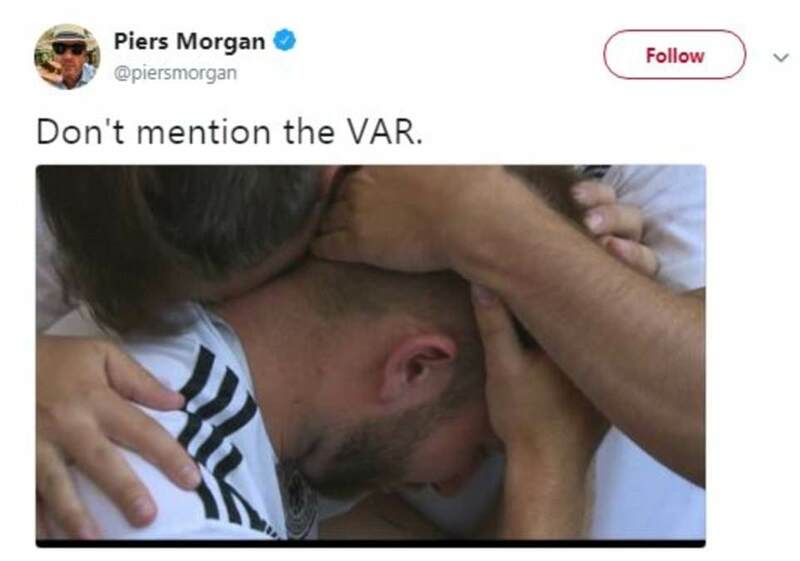 After a last minute goal from Toni Kroos saw the Germans edge past Sweden 2-1 on Saturday, the world champions knew they needed a win to go through. 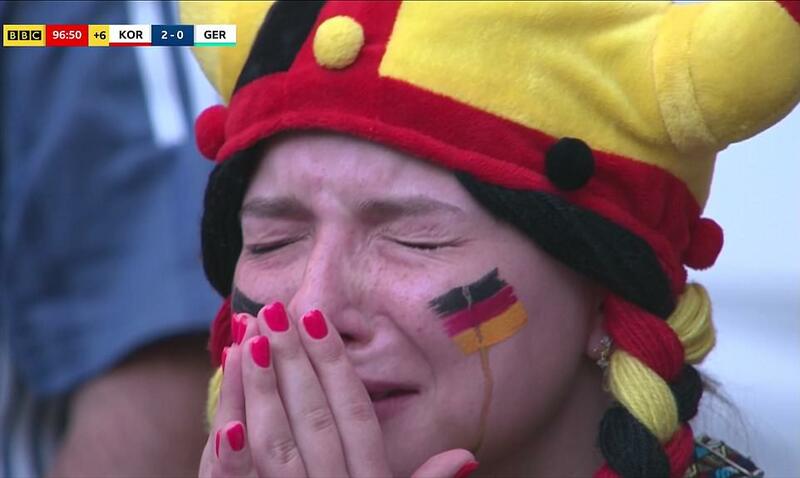 But in the dying minutes of the match the Germans were stunned after Kim Young-gwon netted for South Korea. 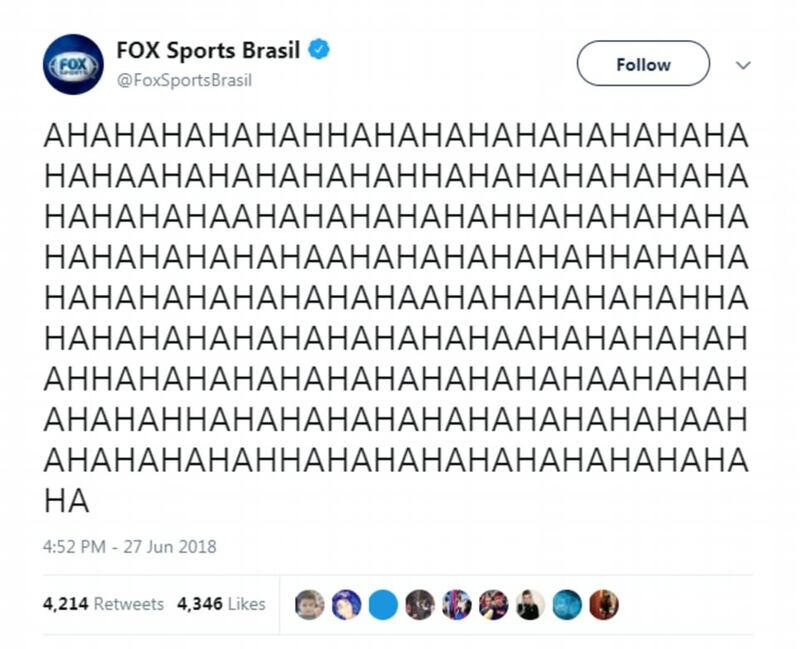 And as they piled on the pressure to save themselves from an embarassing exit, Tottenham Hotspur forward Son Heung-min ended their World Cup dream with a 96th minute goal. 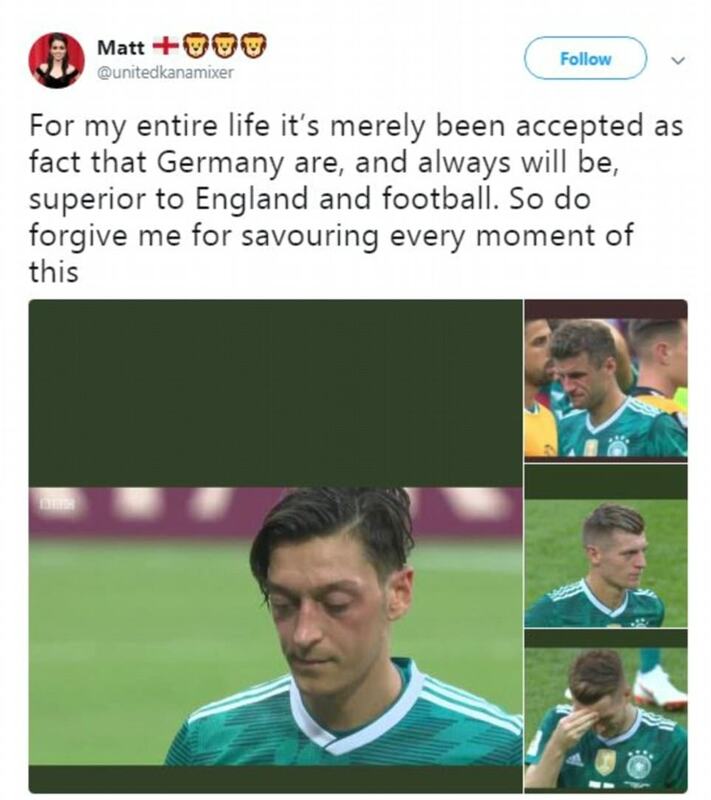 German fans inside the stadium were so angry after the final whistle that one of them was involved in a heated clash with Arsenal’s Mesut Ozil as he left the pitch. The supporter had to be held back by security as Ozil appeared to shout at the fan after full-time. 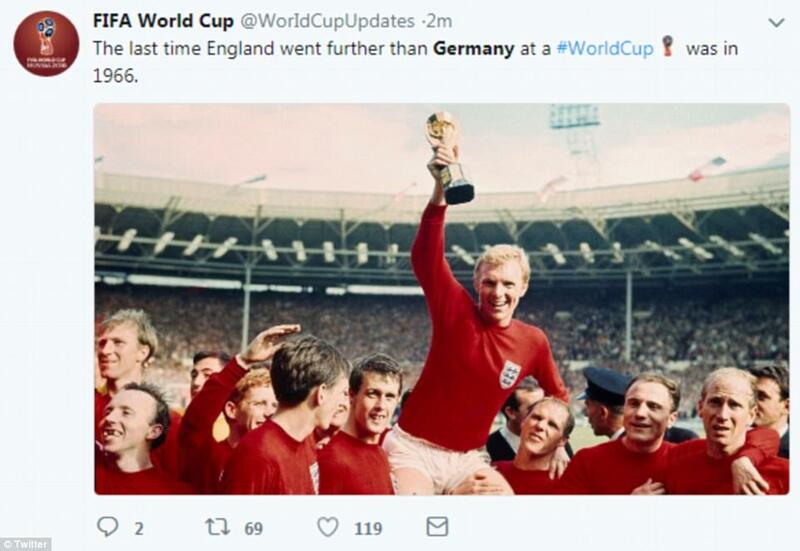 The landmark defeat would appear to be a good portent for England, however, as Three Lions fans on Twitter pointed out that the last time the national side went further than Germany was in 1966. 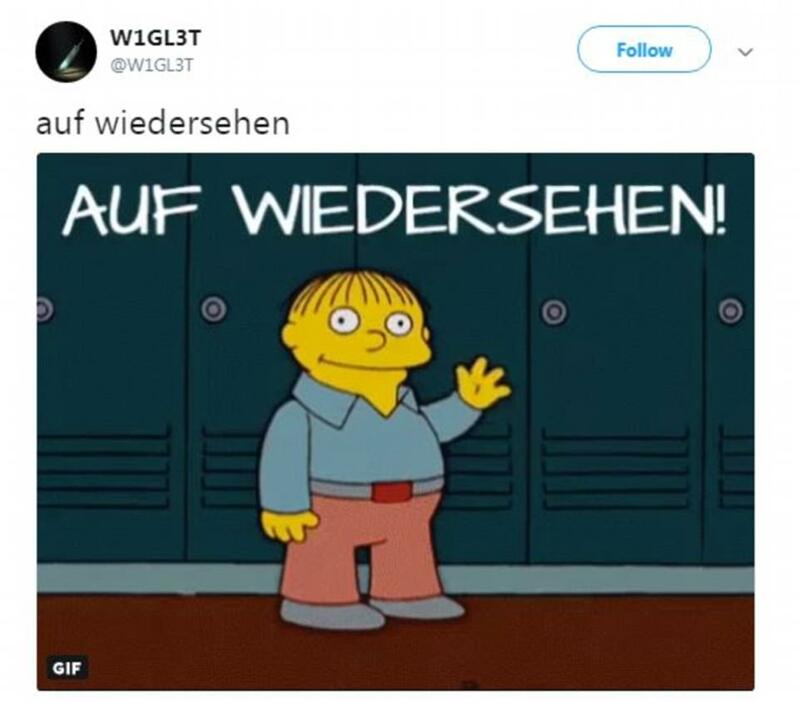 Many England fans could not contain themselves after the shock exit with scores of people tweeting ‘auf wiedersehen’, German for goodbye. 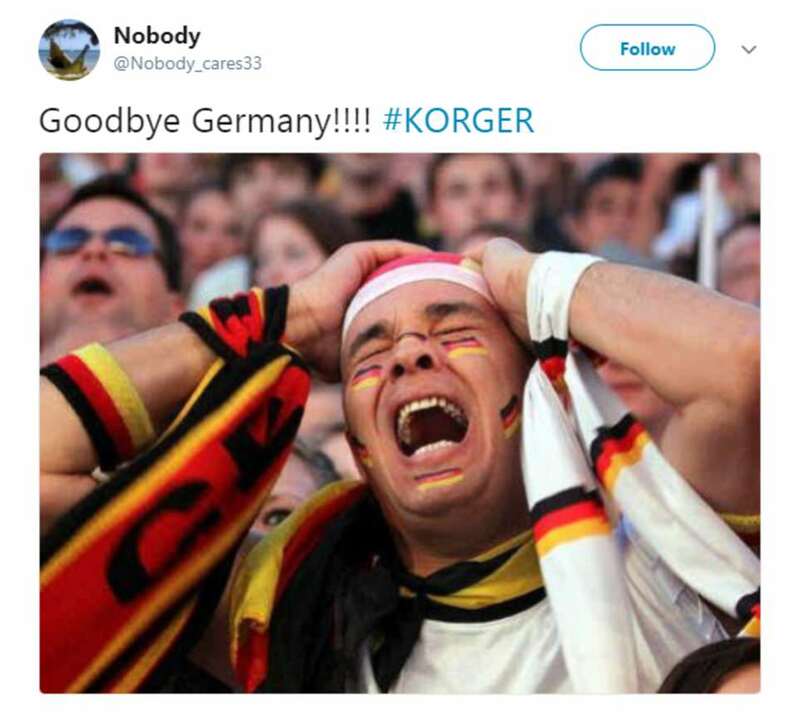 But England fans weren’t the only group rejoicing at the German’s early exit on social media as Brazilian fans took the chance to gloat after their 7-1 drubbing in Belo Horizonte back in 2014. 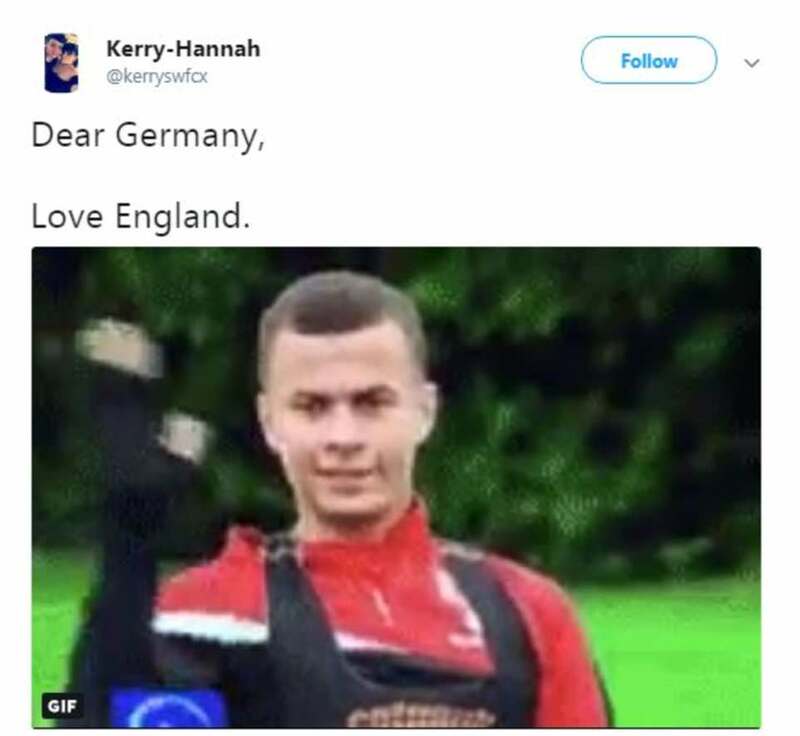 England fans rejoiced as the World Cup bid farewell to Germany. 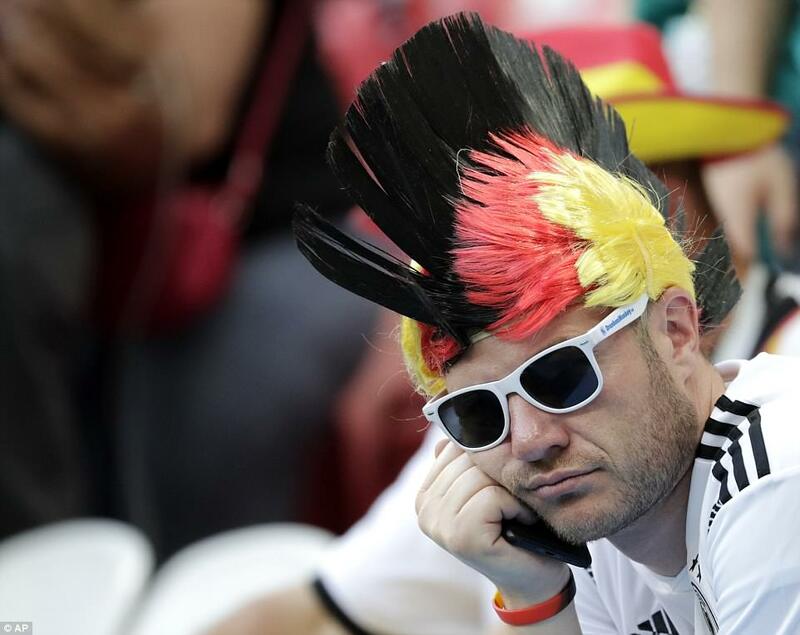 Rhys Anderson,23, of Bermondsey, London, said: ‘I’ve been having nightmares about Germany beating us on penalties. 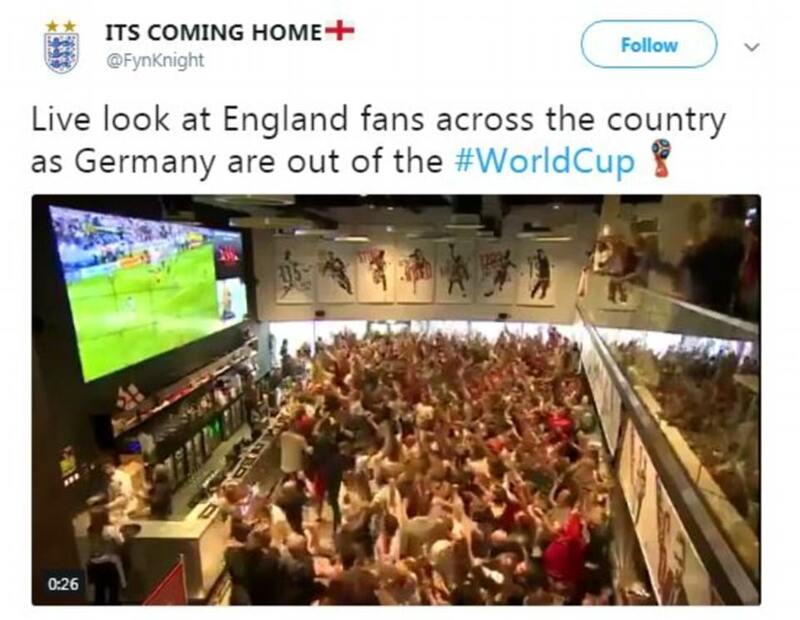 ‘As an England fan you just come to expect it. ‘We could have faced them in the next couple of games but now a huge burden has been lifted. 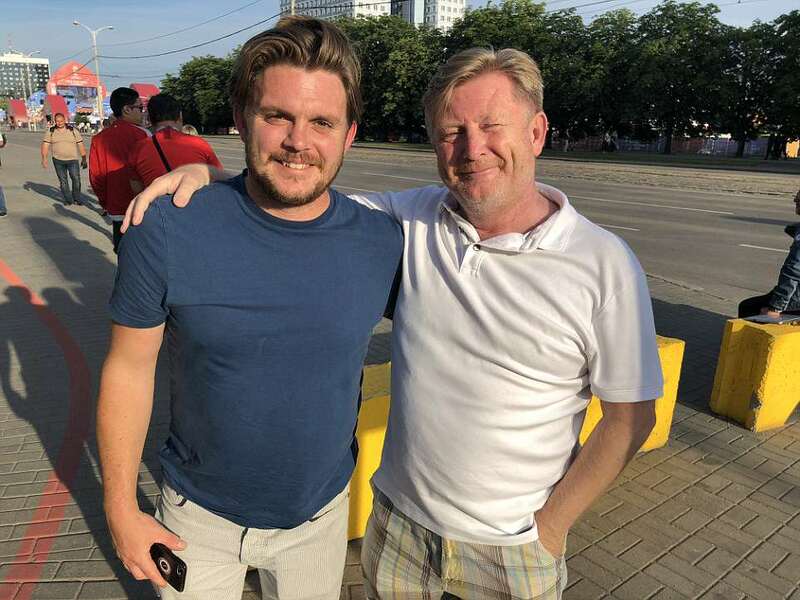 Danny Hunter, 55, Chairman of Boreham Wood football club who is in Kaliningrad for England’s match with Belgium said: ‘If I’m honest I don’t feel any sadness over Germany going out. 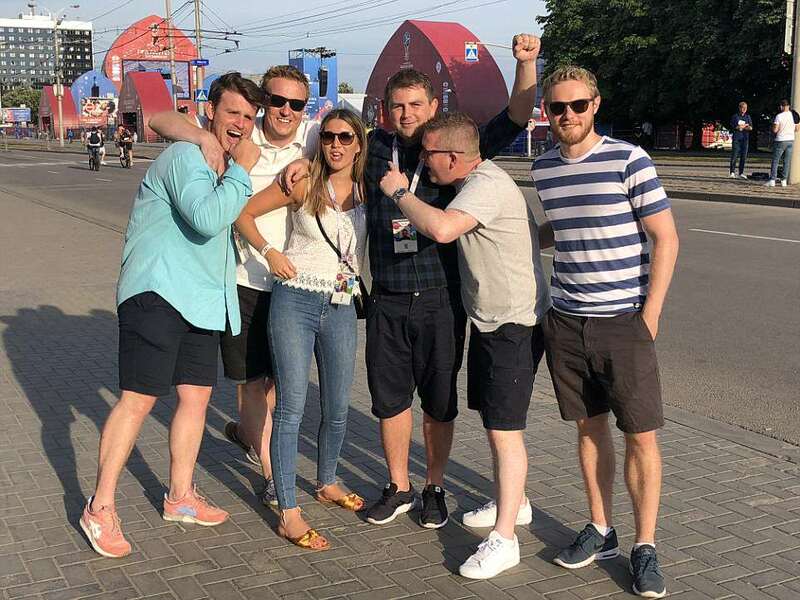 Jack Edwards, 28, of Chingford, Essex danced near the fan zone singing ‘England …England.’ He said: ‘This is a great feeling mate. 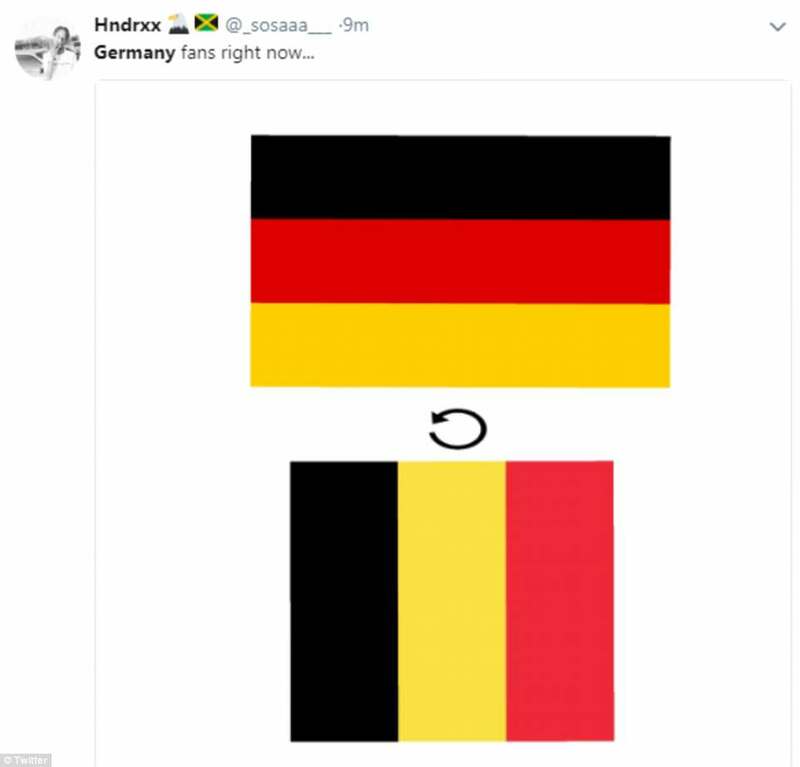 No German resistance ahead for our boys. 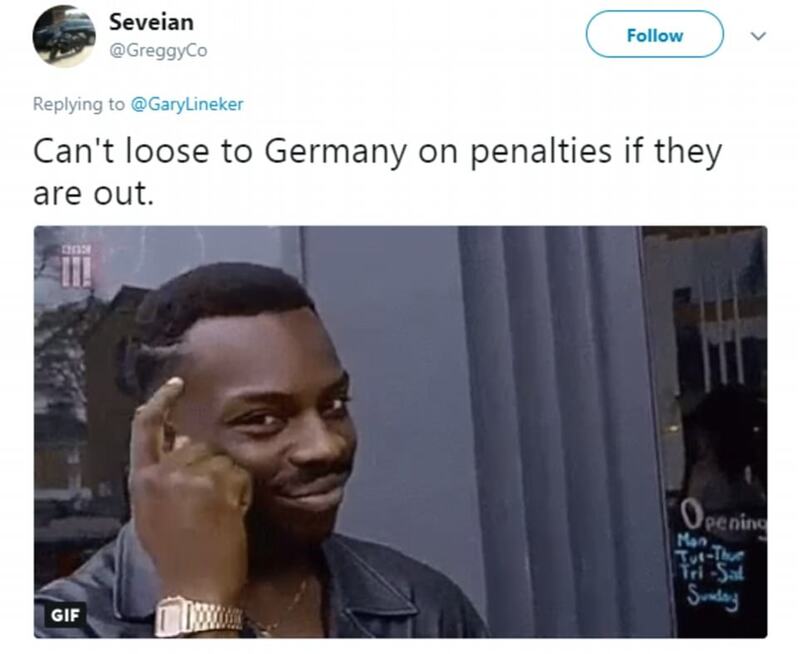 ‘Their team was so smug here thinking they would walk it to the final. 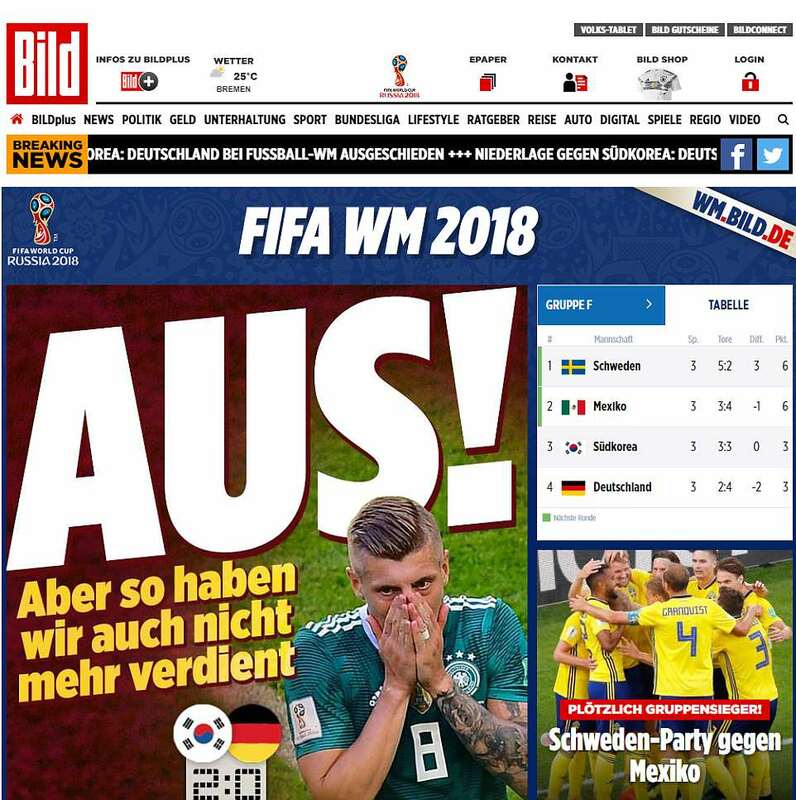 The website of German daily Bild had the huge headline ‘OUT!’ on its homepage after the defeat to South Korea today. 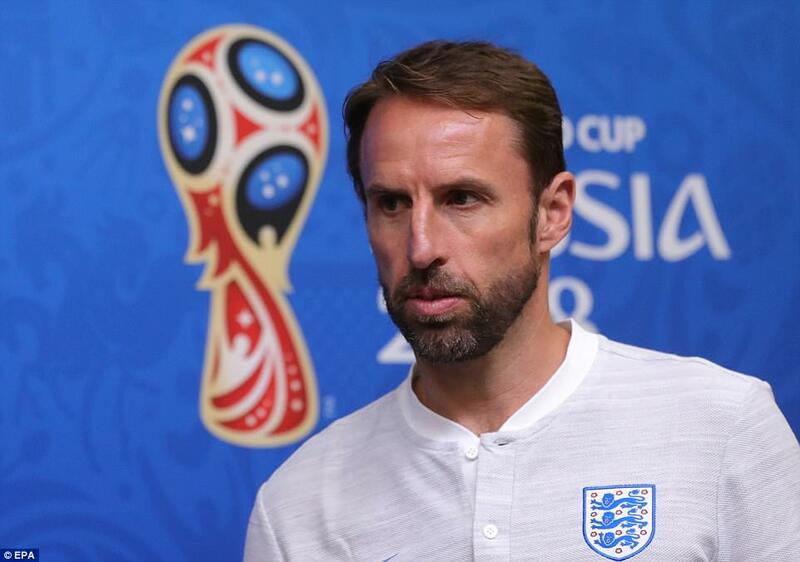 England manager Gareth Southgate was holding a press conference at the same time as Germany were being dumped out of the finals. 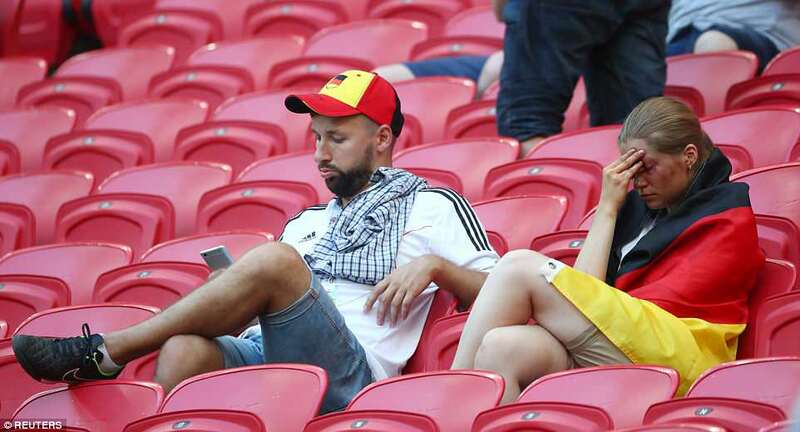 ‘Of course I am surprised,’ he said of both the defeat and the fact that the Germans are heading home after the group stage. ‘I was here last summer for the Confederations Cup and they brought a young team, they also won the Under-21 finals but in this tournament I think they have been ahead for about a minute-and-a-half in their matches. ‘It has been unusual to see them struggle as much as they have but the level of all of the teams is strong and they have played teams who have been tactically very good against them and exposed counter-attack situations in particular. 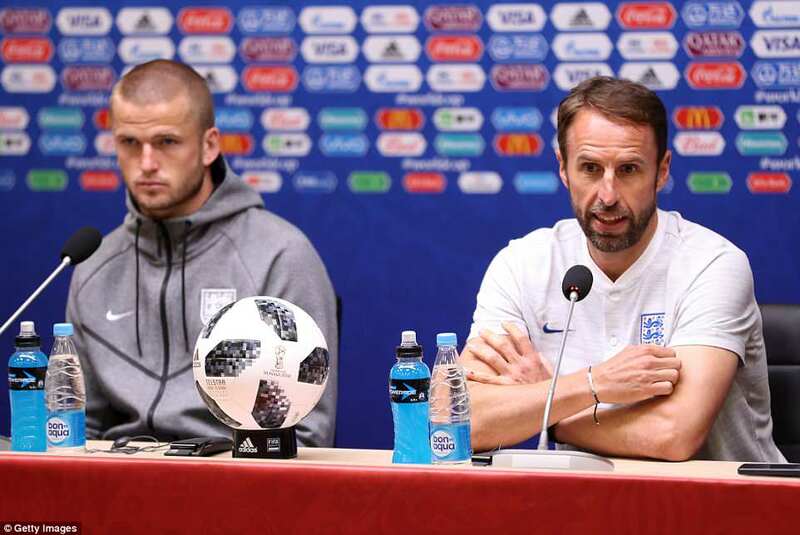 England manager Gareth Southgate was holding a press conference at the same time as Germany were being dumped out of the finals. 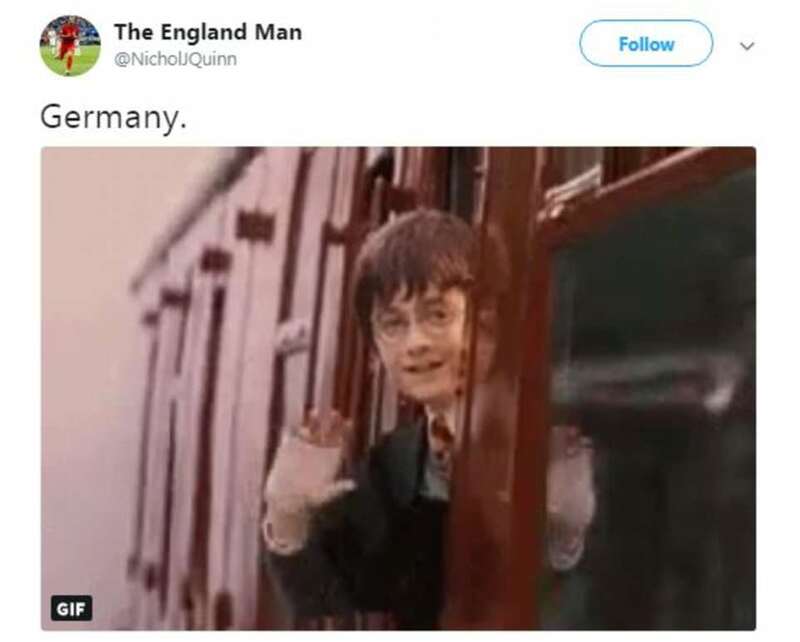 ‘Of course I am surprised,’ he said of both the defeat and the fact that the Germans are heading home after the group stage’. Southgate continued: ‘I don’t think it has any bearing on us. 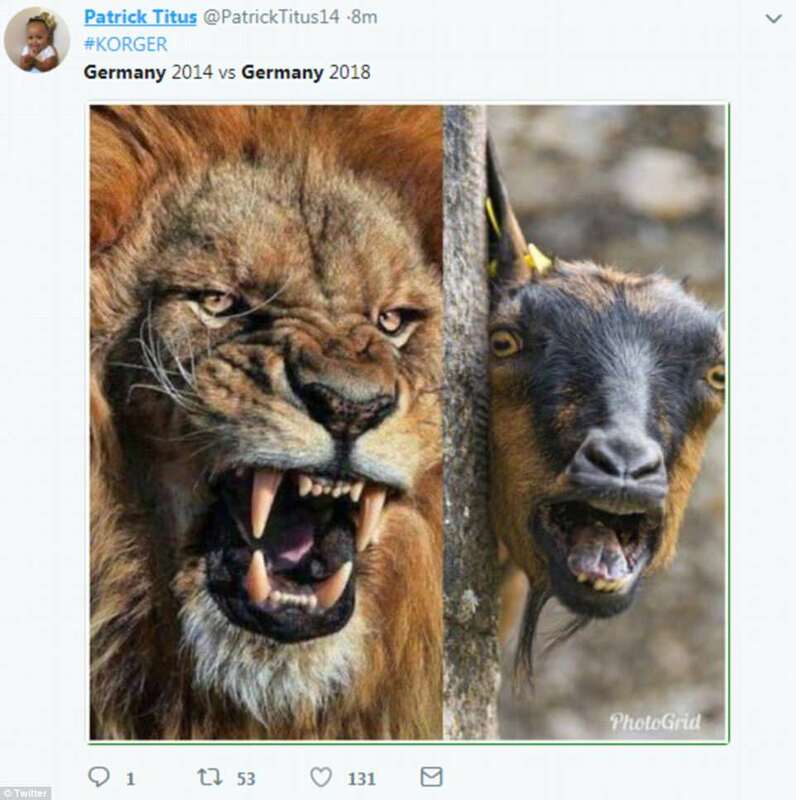 ‘What it shows is that, with Italy and Holland out before we got to this point, Chile – who were in the Confederations Cup final – as well and now Germany. ‘There really is no opportunity to rest on where you are as a team or stop the constant improvement. 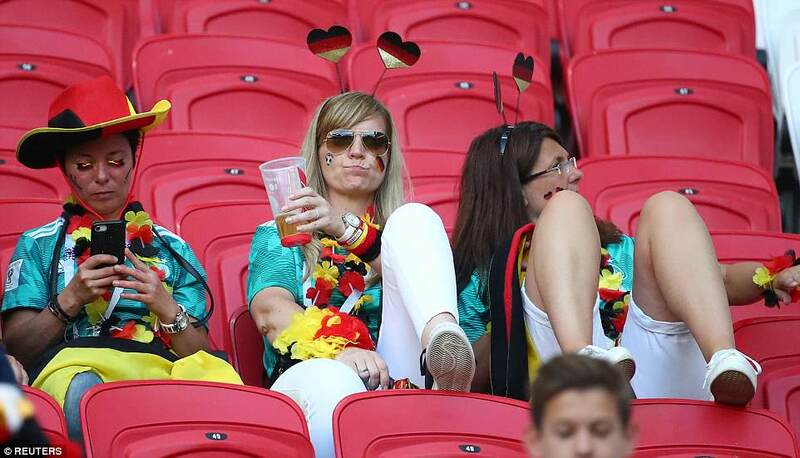 ‘We have learned an enormous amount from studying Germany as a team. 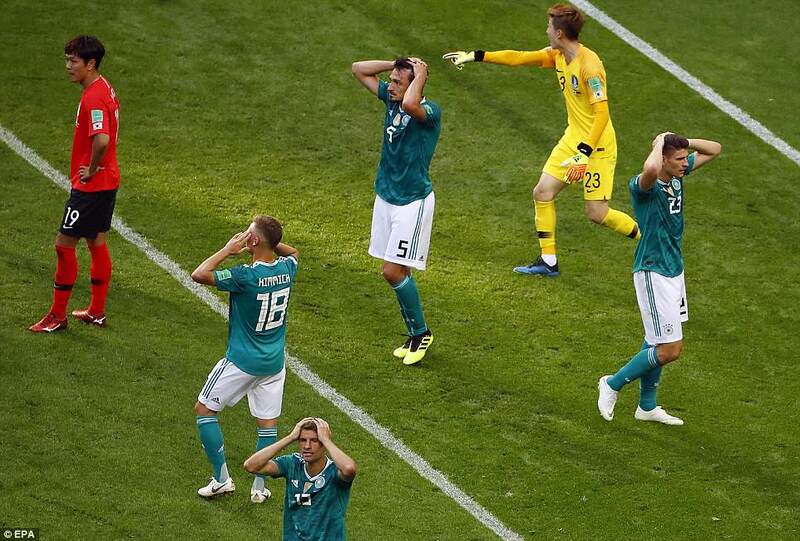 The German media have reacted with horror to the national team’s shock exit to South Korea in the World Cup. The tabloid went on describe the result as an ‘embarrassing end of a catastrophic group’ and a ‘nightmare’. 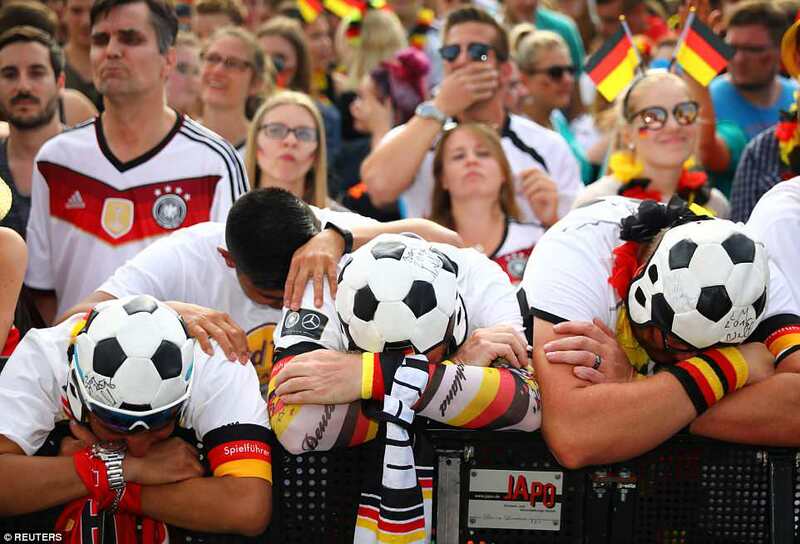 Die Welt said ‘the embarrassment is perfect’ and branded the team’s performance ‘harmless, unimaginative, listless’. 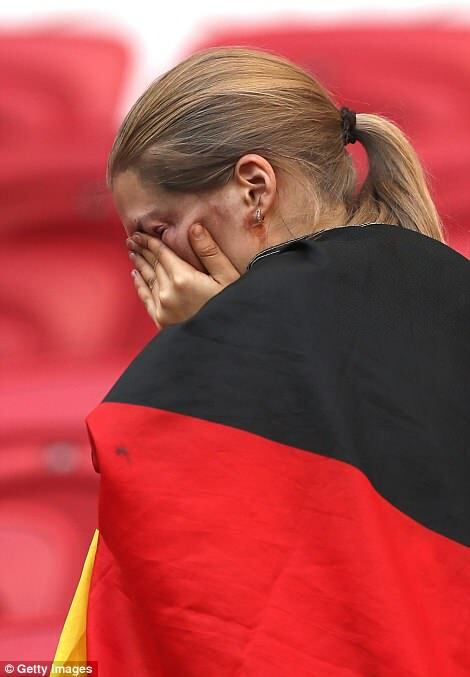 Spiegel led with the headline: ‘Germany is out!’ calling the defeat a ‘historic disgrace’. 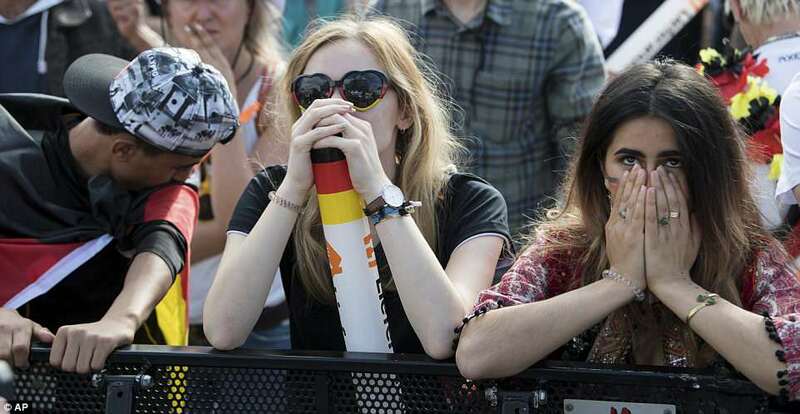 ‘For the first time in World Cup history, the German national team failed in the preliminary round,’ said the paper. 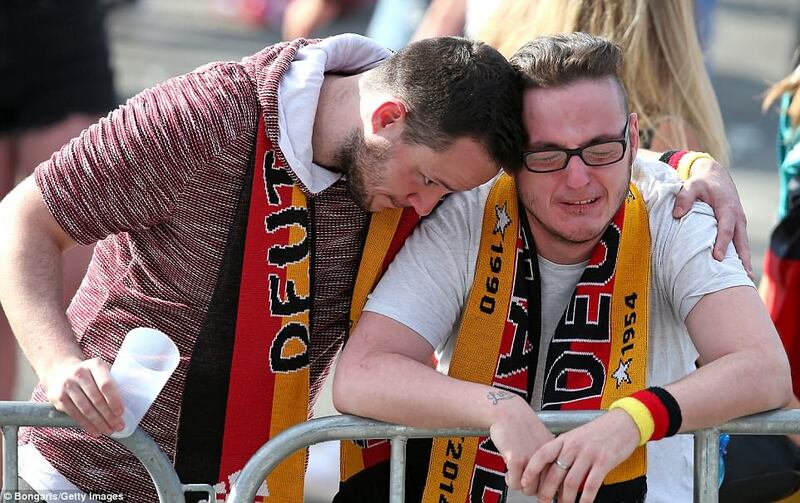 Two German fans in Hamburg console each other after the final whistle saw their team crash out of the World Cup at the group stage. 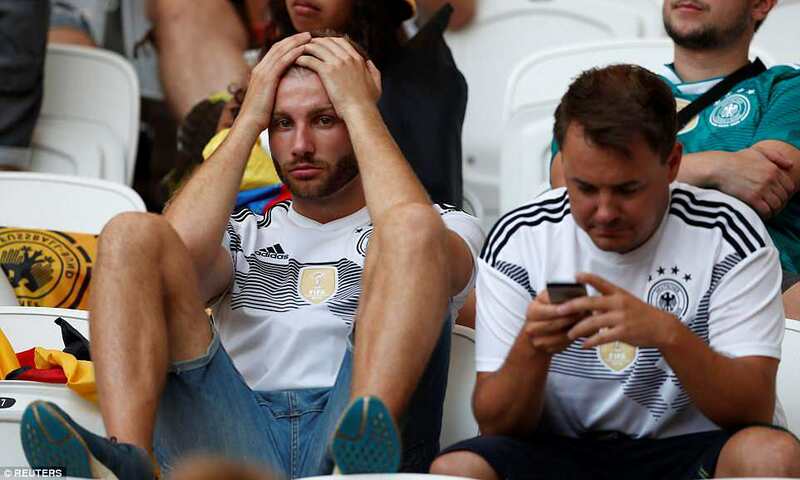 As the magnitude of the defeat began to sink in, Zeit carried a picture of two dejected players sitting on the bench watching the game unfold. 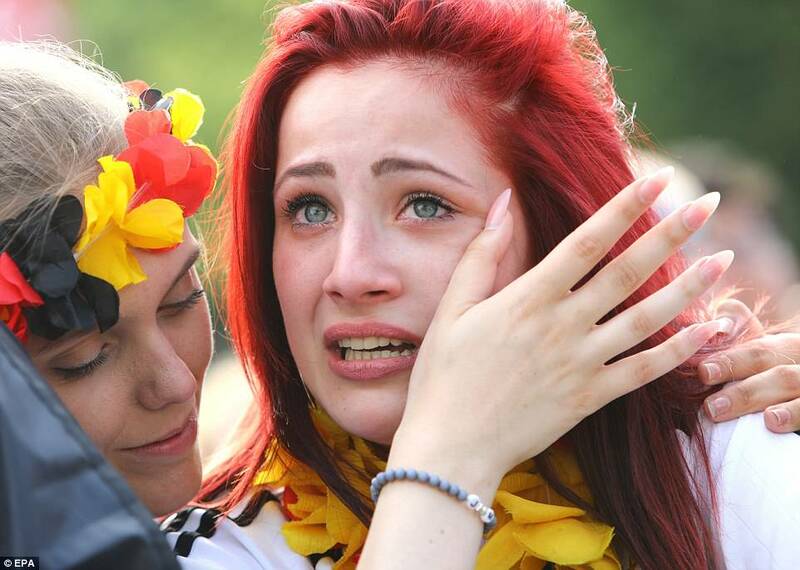 ‘I’ll pack my suitcase … and take the German team with me,’ was the headline. 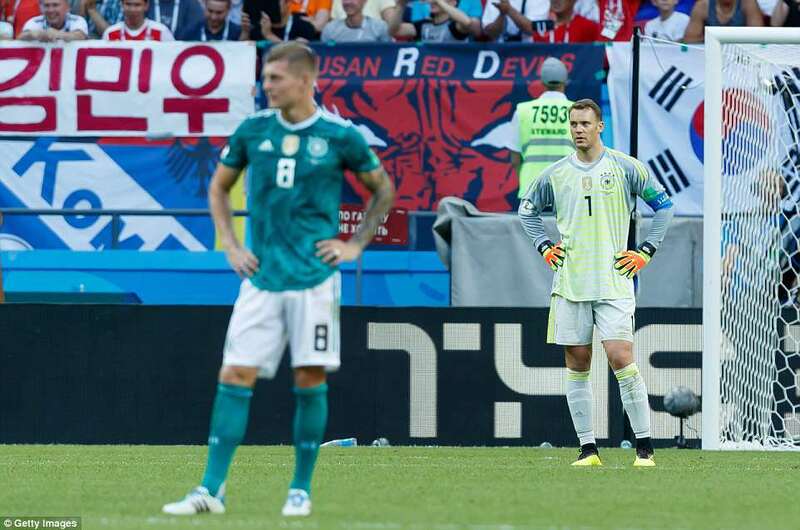 Focus.de said it was defeat for manager Joachim Löw’s ‘helpless troupe’ in what was a ‘shameful final appearance’ in the tournament.